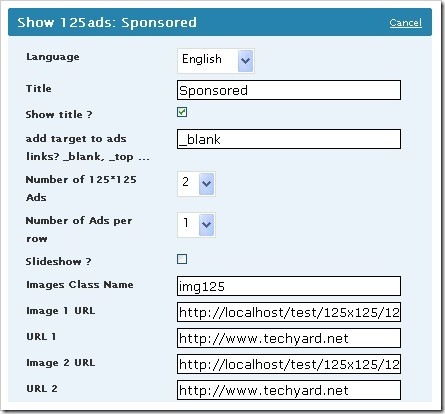 If you are using a wigitized wordpress theme that does not have the 125 x 125 Ad Spots in the sidebar, and you want to place Ads in that spot.It becomes difficult to manage ads if you are changing the ads frequently if you have to change the code.Then Show125 is the answer for you. Show125 is a wordpress widget plugin that lets you add 125 x 125 Adspots to your wordpress sidebar.It also has a slide show effect to the adspots using MooTools Slideshow effect. Upload it to the plugins directory of your worpress installation, and then activate it in the WordPress administration panel. In Design » Widgets, you’ll be able to drag and drop the Show125 widget to your sidebar. Once you filled the fields and saved your changes, you’ll see your ads in your sidebar. Optionally add the target=”_blank” attribute to links, if you want ads to open in a new tab. The plugin is no longer available, instead a similar plugin WP125 is available with similar functionality. Thanks for posting about this, I’m going to try it! How can I display a slightly larger ad? 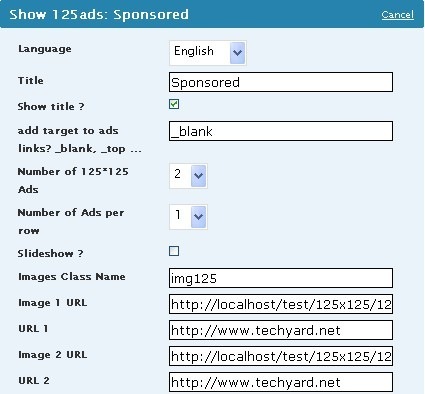 @frioman : for a more larger ad you have insert it manually in the sidebar, this plugin is only for 125 x 125 sized ads.